NORTH Melbourne defender Luke McDonald will miss the Good Friday clash with Essendon, after the AFL Tribunal upheld his one-match suspension on Tuesday night. McDonald had been handed the one-game ban after his clumsy, late spoil on Chayce Jones left the Adelaide youngster with a concussion over the weekend. The Kangaroos attempted to argue that McDonald’s conduct was not unreasonable in the circumstances and that contact with Jones’ head was incidental. 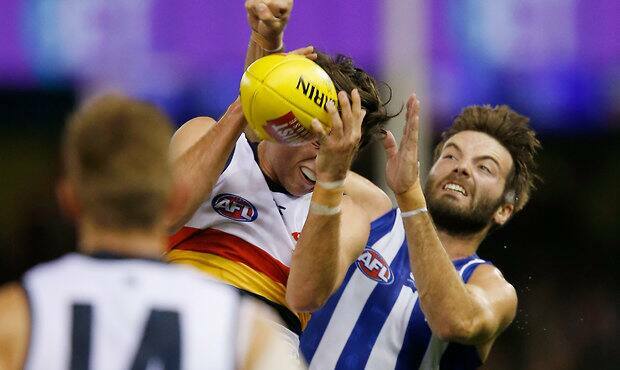 North Melbourne also argued the contact should be graded as low, not as medium. However, following a 22-minute hearing that Tribunal chairman David Jones called “commendably brief”, the Tribunal deliberated for 23 minutes before finding McDonald guilty of rough conduct and upholding a medium impact grading. “I’m obviously really disappointed,” McDonald said afterwards. “I thought we had a pretty good case to get off. But I just hope that Chayce is alright and that he can get up this weekend. Adelaide’s medical report said Jones was now in the normal concussion protocol and could miss Sunday’s clash with Gold Coast as a result of the incident. That alone, according to the AFL’s legal counsel Jeff Gleeson QC, was enough to constitute a medium impact grading. He also said McDonald “could and should” have stopped, upon realising Jones had first taken the mark and then had time to pull the ball down before impacting the contest. Gleeson closed by arguing McDonald had “no reasonable prospect” of spoiling the ball. But the Kangaroos countered by suggesting the vision showed McDonald “continued to reach” towards the ball in an attempt to spoil, making incidental contact with the head. McDonald’s representative, Rob O’Neill, also suggested Jones may have suffered whiplash during the contest which could have resulted in his concussion. However, ultimately, North Melbourne’s appeal proved unsuccessful. The one-match ban was initially handed down by the Match Review Officer after the incident was assessed as careless conduct, with medium impact to the head.